If you have a large yard, spend a lot of time gardening, or need a powerful pest control product, you may want to buy a backpack sprayer. These devices hold much more liquid than handheld sprayers, and they spray with higher pressure. You can use them to treat your yard with pesticides, herbicides, fertilizer, or other lawn care products. 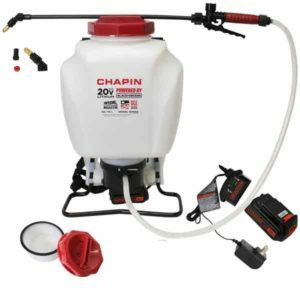 Chapin International is one of the oldest and most well-known backpack sprayer manufacturers, and their Chapin 63985 model is very popular. It has a four-gallon tank and three different spray nozzles, allowing you to choose between mist, cone, and stream. The sprayer is powered with a 20-volt lithium ion battery. The battery can last up to 1.75 hours, and you’ll receive a charger with the package. Lithium ion batteries are fairly cheap and easy to find, so it should be no problem to replace it if it wears out over time. The tank is four gallons and has a six-inch mouth funnel for easy cleaning and filling. Inside the tank is a smaller compartment that pulls in the chemicals and pressurizes them. This interior tank can pressurize the liquid to 35-40 psi, which should be plenty for treating your yard. The sprayer has an in-tank filter that prevents clogging at the tip of the nozzle. It releases a little less than a half-gallon of solution per minute. Although this backpack sprayer is a high-quality product, there are a few issues to look out for. There are padded straps for your shoulders and waist, but some reviewers say the straps are uncomfortable. The hose attaches to the bottom center of the tank, so it may be difficult to reach behind and grab the wand while you’re wearing the backpack. This sprayer doesn’t have a lock-on or lock-off feature, so you have to hold the trigger down at all times to pressurize the chemicals. One reviewer recommends using a piece of wire to hold down the trigger. Also, a few reviewers said that their tank leaked where the hose connected. However, Chapin International has great customer service, and they should help you out if your sprayer has a leak. You can use the Chapin sprayer for pesticides, weed killers, fertilizers, or other chemicals. If you’re switching between chemicals, make sure to rinse the tank and nozzle with water. Overall, the product has great reviews from professionals and from people who have used it on their own lawns and gardens. It’s comfortable, easy-to-use, and long-lasting. 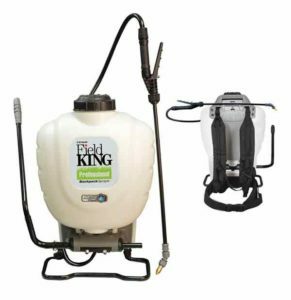 The Field King 190328 sprayer has a four-gallon tank and four metal nozzles: a brass adjustable nozzle, two flat fan nozzles, and a foaming nozzle. These will give you a wide selection of sprays, so you can get thorough coverage across different landscapes. The backpack can hold liquids or dissolvable powders, and the tank has paddles that continuously mix the solution and keep it from separating. The backpack uses a no-leak pump design, so you don’t have to worry about dangerous chemicals dripping onto your back or legs while you work. To assemble the Field King sprayer, all you have to do is attach the handle to the rest of the unit. When you fill up the tank, the chemicals will be filtered through a strainer to keep out debris. The handle is reversible, so lefties can use this backpack just as easily as right-handed people. The internal pump can pressurize liquids to 150 psi, which is a much higher pressure than most backpack sprayers. However, you will have to pump quite a bit to keep the pressure up. You can either pump continuously while you walk and spray or take turns between pumping and spraying. The biggest issue with this sprayer seems to be storage. Although the seller mentions a foldable handle, most reviewers say that this isn’t true. Once you attach the handle, you can’t put it in an upright position. It stays mostly horizontal and sticks out from the rest of the backpack, so storing it might be tricky. Field King is a trustworthy brand, and the 190328 sprayer is an easy and effective product. It’s built well with cushioned straps and a back pad, so you can wear it for a long time without getting uncomfortable. Even though it weighs about 50 pounds when full, it’s designed to avoid putting pressure on your lower back. This is a good option for anyone, especially people who are worried about straining their back from carrying a heavy or uncomfortable pack. The M4 backpack sprayer has a four-gallon translucent tank, so you can always see how much liquid you have left. It’s a little heavier than other backpack sprayers because it has a 12-volt lead acid battery. This battery should provide 30 to 40 minutes of non-stop spraying, and the package will come with a charger. The product includes a plastic wand for spraying acids and a steel wand for other chemicals. You’ll also get several nozzles for different types of sprays. When you fill up the tank, the solution will pass through a filter to remove dirt and debris. The backpack has a lock-on feature, so you don’t have to hold down the trigger to keep the solution pressurized. The backpack can pressurize the liquid to 60 psi, which gives you a vertical range of 20 feet. If you need to spray tall walls or trees, this backpack could be a great option. It also has an adjustable pressure dial, so you can cover shorter or longer distances. Because the M4 is battery-powered, you don’t have to manually pump to pressurize the liquid in the tank. Unlike the Chapin sprayer, you don’t even have to hold down the trigger. As long as you remember to charge up the backpack before you use it, all you have to do is turn it on and start spraying. This is probably one of the easiest backpack sprayers to use, so you’ll be able to focus your attention on thoroughly covering the area. Unfortunately, the M4 sprayer is one of the more expensive products on the market. It’s worth the cost, but you might not be willing to buy it unless you’re serious about lawn care or pest control. You may also have an issue with the shoulder straps. Some tall reviewers say the straps are too short and tight for them, which creates strain. With the backpack being heavier than average, it might not be the most comfortable option. You can buy a hose extender or a rolling cart to keep the pack on, though, so you don’t have to carry it on your back. 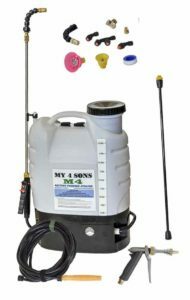 The M4 is one of the highest rated backpack sprayers. It comes with a wide variety of helpful equipment, and it uses high pressure to cover large areas. Also, if you have any issues with the product, you can count on the manufacturer to help you out. You can call, text, or email them and get a quick response. They’re very helpful with issuing refunds or replacements and with giving instructions for proper use. 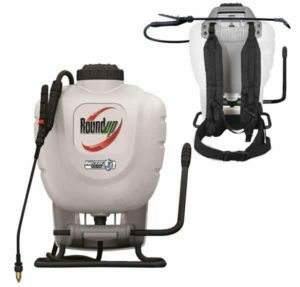 The Roundup backpack sprayer is made by the same manufacturer as the Field King, so they have very similar features. The product comes with four different nozzles for fan, cone, and foaming stream patterns. There’s an agitator inside the tank that mixes the solution while you spray it. You can use liquid chemicals or dissolvable powders mixed with water. Like the Field King sprayer, this product doesn’t have a battery, so you’ll have to pump the lever to pressurize the solution in the tank. It may take several pumps for just a few seconds of spraying, so this might be more time-consuming than using a battery-powered backpack. You don’t have to worry about keeping a battery charged, though. Also, like the Field King, it may be hard to find a good place to store this sprayer because the handle sticks out from the tank. The interior tank in the Roundup sprayer can pressurize the solution to 150 psi. It will take a lot of pumping to reach 150 psi, but you don’t need that much pressure to cover the average yard. It’s designed to prevent leaks and spills, so you shouldn’t have to worry about getting chemicals on your clothes or skin. With the lockable trigger, the product can spray continuously without requiring you to hold the handle. The backpack has adjustable padded straps, lumbar support, and chest and waist belts. Many reviewers say that it’s comfortable and easy to carry around, even when the tank is full. The Roundup is one of the less expensive backpack sprayers. It seems to be very reliable, durable, and easy to use, so it’s a good option for people who are willing to use a pump instead of a battery. The Solo 425 is a popular four-gallon pump sprayer. It comes with four different nozzles, so you can switch between jet, fan, cone, and adjustable streams. With the jet stream and the maximum pressure, you can spray up to 25 feet away. The other nozzles won’t cover nearly as long of a distance, but they provide more thorough coverage at a close range. The tank has a 4.25-inch opening for easy filling and cleaning, and the product comes with a filter to prevent dirt or debris from getting into the tank. The tank is made mostly of corrosion-resistant plastic, so it’s not weighed down by unnecessary metal or rubber parts. The metal and rubber pieces don’t make contact with the chemicals, so they won’t get worn down over time. The Solo 425 has a four-foot hose, which is much longer than most other backpack sprayers. It doesn’t have a battery, so you’ll have to pump manually to pressurize the chemicals. It does have a lock-on and lock-off feature for the sprayer, though, so you don’t have to pump and hold down the sprayer at the same time. The pump is interchangeable for the left and right sides. Several reviewers mention that the straps are uncomfortable or poorly-designed. There isn’t a chest strap, so the tank might put strain on your back when it’s full. Some users say the shoulder straps are too short or that they dig into the shoulders and cause discomfort. If you’re willing to modify the product on your own, you could add your own chest strap or add extra padding to the shoulder straps. However, if comfort is one of your priorities, this sprayer might not be the best option. Leakage also seems to be an issue with some users, especially after using the sprayer several times. The manufacturer offers a one-year warranty, though, and issues like this should hopefully be covered. 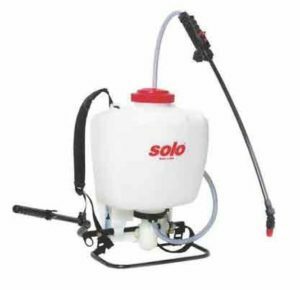 The Solo 425 backpack sprayer is compatible with a wide variety of chemicals, including fertilizers, pesticides, and formulas for tree and plant protection. It’s a great sprayer for people who need to cover a wide area and are okay with a little discomfort from the shoulder straps. Backpack sprayers aren’t cheap, so you should understand what you’re buying. There are several types of sprayers with different features and benefits. You should consider how much area you need to cover, what chemicals you need to use, and how quickly you think you’ll tire out. Backpack sprayers usually hold four gallons of solution. Each gallon will add about eight pounds of weight to the pack. Inside of the main tank is a smaller pressurizer tank, which draws the solution in and holds it under high pressure. Then, the pressurized liquid is released into the hose and travels through the nozzle. Most products come with several different nozzles that can spray the solution in a variety of patterns. Cone and fan stream patterns cover a wider area quickly, but jet streams usually reach a farther distance. Most sprayers can handle herbicides, pesticides, and fertilizers. You should check the manufacturer’s label to make sure the chemicals you plan on using won’t damage the sprayer, though. Some tanks have an agitator inside that mixes up the liquid. If you want to use a water soluble powder or a solution that will separate when left still, this is an important feature to look for. When you empty the tank, fill it up with half a gallon of water and spray it until it runs out. This will clean the tank and hose, which is especially important if you’re switching between different chemicals. There are two main types of backpack sprayers: manual and battery-powered. Manual sprayers use a hand pump to draw the solution into the pressurizer tank. You’ll have to continually pump the handle to be able to spray the chemicals, and the harder you pump, the higher the pressure will be. Battery-powered sprayers use the rechargeable battery to pressurize the liquid, which reduces the amount of work you have to do. However, the battery adds extra weight to the pack, and you’re out of luck if the battery dies in the middle of your lawn treatment. Are manual or battery-powered sprayers better? It depends on your endurance and your priorities. Some people have no problem with using the pump, but others find the extra work too tiring and frustrating. If you have a large area to cover, though, a battery might not last long enough. Battery-powered sprayers may be easier, but manual pumps are usually more reliable. Battery-powered products also tend to be significantly more expensive. Weight is an important factor when choosing a backpack sprayer. Ask yourself honestly: How much weight can you carry around while also operating a pump and holding up a spray nozzle? Most backpack sprayers are similar weights, but even a few pounds can make a difference. Some products have better features than others for comfort. You should look for padded straps, chest and waist straps, and back support. There’s nothing worse than waking up the morning after completing a physically demanding task and realizing that you put too much strain on your body. There are so many different backpack sprayers that it’s impossible to recommend just one product to everyone. Every sprayer on this list is great for different reasons, but you should always make a careful decision. Would you prefer the ease of a battery-powered sprayer or the durability and reliability of a manual sprayer? Do you need a tank that will keep mixing up the solution while you spray it? How important are weight and comfort to you? If you choose a backpack sprayer that fits your criteria, you should have a great experience with it. Backpack sprayers cover larger areas more quickly and easily than handheld sprayers. As long as you make a careful choice and take good care of the product, your sprayer will make lawn and garden care much easier. Anthony Wheeler is a 42-year-old blogger. He is a mechanical engineer and received his Masters in Materials Science and Engineering from North Carolina State University. He is responsible for analyzing mechanical engineering projects, specializing in motor vehicle and marine accident investigation and reconstruction.